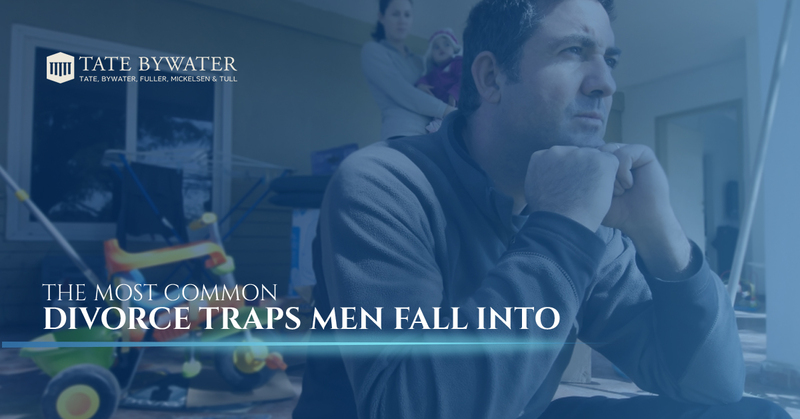 When a marriage is moving towards its unfortunate conclusion, husbands and fathers tend to fall victim to various emotional traps. Frequently, husbands think they can make legal concessions to as a last-ditch effort to save their marriage by making grand gestures. Sometimes these gestures are monetary, meaning husbands will concede financial rights in an effort to win their wife back. Others can be even more costly, taking away precious time with their children. We at Tate Bywater Law want you to be aware of some of the most common emotional pitfalls we’ve seen in our many years of experience in the Vienna and Fairfax County regions. Often we see husbands eager to get the process done with as quickly as possible. This can result in agreeing to terms that sound good in name, such as a “reasonable right of parenting time”, but in reality that can mean any number of things when all the chips have fallen. For example, in Michigan, that typically means the father will alternate weekends and one afternoon during the week, which totals to less than 25% of the year. Does that still sound “reasonable” to you? On the other side of the coin, we’ve seen men be cognizant of the mistakes others have made, and have overcorrected by being too aggressive much too quickly. All of the financial facts must be on the table before any negotiations can even begin. Don’t make the mistake of making demands before formulating a strategy with your legal counsel. This can result in bitterness for both parties, which will only prolong the already painful process. Recognize that the process of divorce is more of a marathon than a sprint, and you must treat it as such. In this difficult time, the natural tendency for anyone is to point out the flaws and mistakes of their soon to be ex-spouse. The blame game is an easy trap to fall into, but must be avoided as much as possible. You don’t want to say anything that can come back and nip you in the backside. Slander (characterized by a perceived false allegation) and defamation (even on social media!) can cause someone to lose their job or social standing in a community group. You really don’t need another law suit on your hands, so it’s best to stay away from the temptation as much as possible. You are going to want legal counsel that can keep a clear head and provide experienced guidance. Divorce is often a painful experience for everyone, so don’t make the mistake of finding a shark attorney that is too aggressive, who will only end up creating more strife in an already tumultuous environment. Our divorce attorneys at TATE BYWATER Law are committed to advocating for you, and sometimes that means protecting you even from yourself. With our experienced attorneys we will be aggressive when called for, and well measured when we can. You can count on us to provide elite representation at a time when you need it most. If you are looking for a family law attorney in the Fairfax or Prince William Counties, consider TATE BYWATER Law.